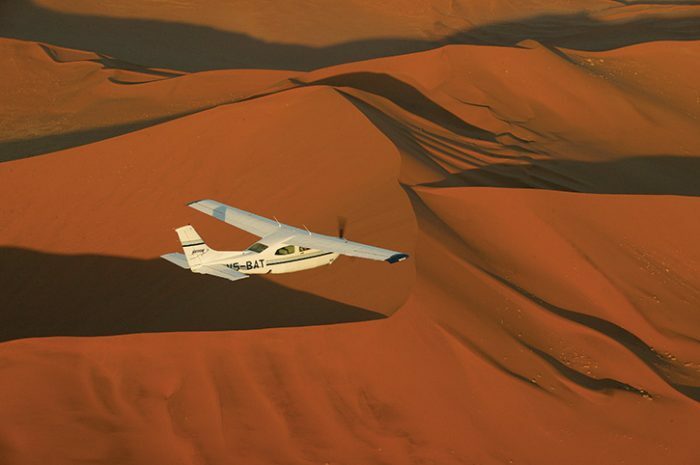 Experience an air safari over the desert landscapes and game parks of Namibia. You will travel in a light aircraft seating generally no more than 8 people and flying into airstrips close to the parks. Receive a briefing from your pilot this morning at Windhoek’s Eros airport, before flying over the great escarpment into the vicinity of Sossusvlei. Transfer to Sossusvlei Lodge located by the entrance gate to the national park, with the remainder of the day at leisure. The next morning enjoy a guided tour into the famous dunes and climb to the top for some amazing photography. After breakfast, board your plane and keep your camera ready as you fly over the dune landscape of the oldest desert on Earth and up the coast where you might be able to spot shipwrecks and numerous seal colonies. The beachside town of Swakopmund is known for its German style architecture and café culture and you will have two days here to relax or enjoy the optional activities. Leave the coast behind and proceed inland to the Damaraland region, an area of steep mountain massifs and meandering dry riverbeds that are home to the unique desert elephant and black rhino which can be seen on an optional tour. Your lodge for the night is located close to the famous petroglyphs of Twyfelfontein and other striking rock formations that you will see on a guided tour. After a short flight, transfer to your lodge close to Etosha, Namibia’s premier wildlife reserve. The park is known for its vast salt pan and the waterholes along its boundary which attract large numbers of animals including elephant, black rhino and the big cats. A game drive will be taken each day in search of these. 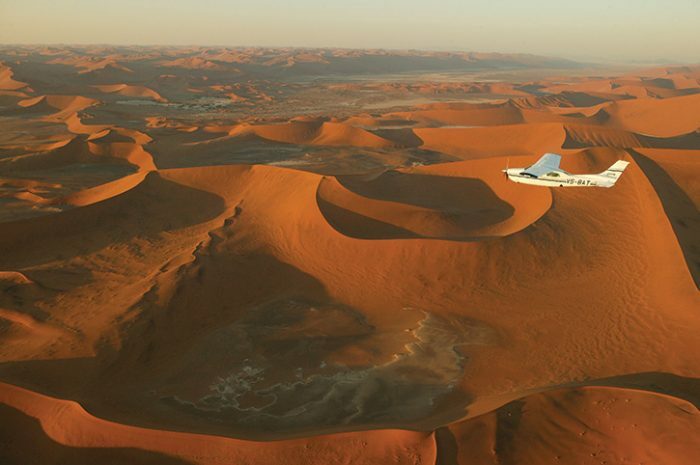 Enjoy one last scenic flight as you head back to Windhoek for your onward travel arrangements. 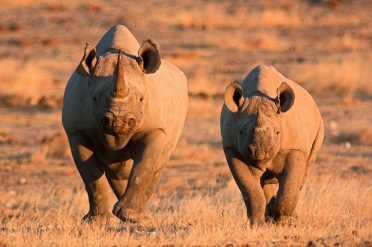 This tour can also be taken as a shorter Southern Circuit (visiting Sossusvlei & Swakopmund) – from £1585pp. 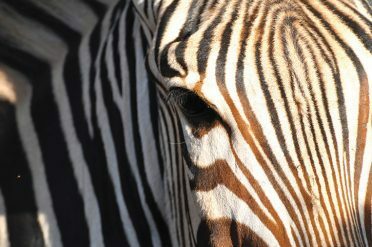 Alternatively, choose the Northern Circuit (visiting Damaraland & Etosha) – from £2679pp. 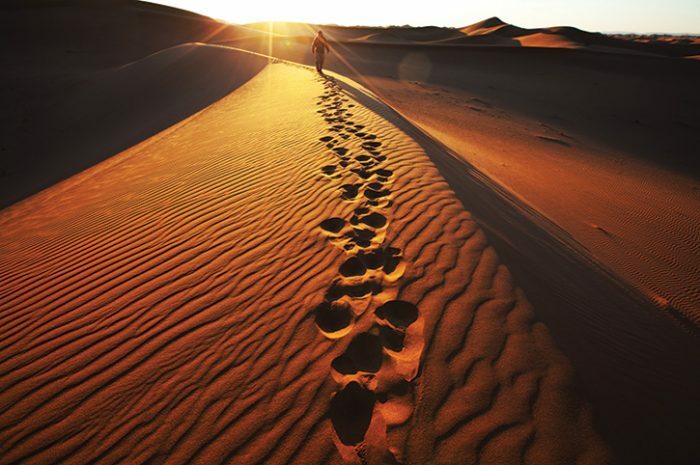 Include a Desert Elephant tour from £75pp. Accommodation upgrade options also available – please ask your Africa Expert for details. Tour departs daily. Accommodation specified is subject to availability and may be substituted to a similar or higher standard if necessary. International flights not included. Please note luggage restriction of 20kg in soft sided bags.